At birth, your children were welcomed into the Jewish people through the Brit Milah, Brit Chayim, or naming ceremony. At an early age they were consecrated into Jewish learning in the Religious School. Now as your son or daughter passes his or her 13th birthday (on the Hebrew Calendar), he/she will be called to the Torah as a Bar/Bat Mitzvah. This moment marks their transition as they mature into their role as Jewish adults. Although not yet fully grown, a Bar/Bat Mitzvah is now responsible to behave ethically, choose to continue learning, and be full and active participants in Jewish ritual. This is one more step in the process of learning leading to Confirmation and beyond. Jewish life is a progression of ceremonies, each marking one step towards the goal of a lifetime of Jewish learning, commitment and celebration. Each ceremony marks the beginning of a new, more mature stage. None, including becoming a Bar/Bat Mitzvah, is an end in itself. 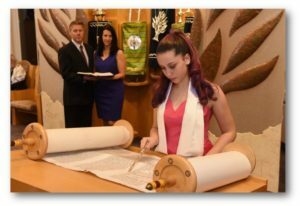 The educational program at The Reform Temple of Rockland builds both up to, and beyond, the Bar/Bat Mitzvah ceremony and includes all subjects necessary for a comprehensive Jewish education – history, ethics, philosophy, customs and ceremonies, prayer, Hebrew and Israel. Students are able to acquire Bar/Bat Mitzvah skills only through careful study for a number of years. Our curriculum goes way beyond Bar and Bat Mitzvah, however. It is expected that your child’s Jewish studies will continue through the tenth grade (Confirmation) and beyond into the Post-Confirmation program. When our students and their families sign the Bar/Bat Mitzvah certificate which the Temple presents, they affirm their lifelong commitment to active participation in worship and Torah study (avodah), community service and good deeds (gemilut chasadim), and acts of righteousness (tikkun olam). At the Reform Temple of Rockland, our B’nei Mitzvah program is catered to each individual child, taking into consideration their interests (especially as they apply to a mitzvah project), learning styles and abilities, and temperament. Celebrating this milestone with your family, is one of our community’s greatest joys. Mazal tov! If you are being given the honor of doing the Blessing Before or After a Torah Reading, please click the appropriate links to the right. Click Here for the Aliyah transliteration.